Union officials and members, politicians and members of the rail industry have been among those paying tribute to "admired and feared" RMT union leader Bob Crow, who has died aged 52. Many have expressed sorrow at the loss of a "fighter" and "defender of public safety". Both ends of the political spectrum have spoken of their respect for the man who headed the rail workers' union from 2002. London mayor Boris Johnson said it was a "sad day", while Labour leader Ed Miliband hailed a "major figure in the Labour movement". Mr Johnson said: "I'm shocked. Bob Crow was a fighter and a man of character. "Whatever our political differences - and there were many - this is tragic news. "Bob fought tirelessly for his beliefs and for his members. "There can be absolutely no doubt that he played a big part in the success of the Tube, and he shared my goal to make transport in London an even greater success. He later told the BBC Mr Crow was widely misunderstood and was not the "left-wing ogre" he was considered to be by the wider public. "If anything he was more moderate than some of the other characters in the RMT," said Mr Johnson, adding that Mr Crow was known to be the man you would go to "if the deal was to be done". Ed Miliband praised a union leader who was a "passionate defender of and campaigner for safe, affordable public transport". "Bob Crow was a major figure in the Labour movement and was loved and deeply respected by his members," he said. "I didn't always agree with him politically but I always respected his tireless commitment to fighting for the men and women in his union. "He did what he was elected to do, was not afraid of controversy and was always out supporting his members across the country. "My thoughts are with his family, friends and colleagues in the RMT". Transport Secretary Patrick McLoughlin said he would remember Mr Crow for his "passionate voice for safety on the railways and the wellbeing of those who work on them. "While we may not always have agreed on how to run our railways, he was a powerful advocate who led his organisation from the front and made an important contribution to the debate around the future of rail services in this country." He said Mr Crow was always "very straight" with his dealings with the government. David Cameron's official spokesman said: "The prime minister expresses his sincere condolences to Mr Crow's family and friends." Lib Dem leader Nick Clegg tweeted: "Sad news. Bob Crow was a fighter and a force. Condolences to his family and friends." Former Mayor of London Ken Livingstone said Mr Crow had fought for his members despite being demonised by the right-wing press. He told Sky News: "He fought really hard for his members. The only working-class people who still have well-paid jobs in London are his members." He added: "With the passage of time people will come to see that people like Bob Crow did a very good job." On Twitter, UKIP leader Nigel Farage wrote: "Sad at the death of Bob Crow. I liked him and he also realised working class people were having their chances damaged by the EU." There were many tributes from Labour MPs, including Jeremy Corbyn, who tweeted that he was "devastated" at news Mr Crow's death. "Great Trade Unionist, Railway worker and leader of RMT. Very sad, all sympathy to family and Union." John McDonnell MP tweeted: "In Bob Crow we have lost one of the finest trade union leaders and socialists our movement has known. I am devastated by this tragic news." MP Stephen Pound, who sits on the RMT parliamentary group, said he was "absolutely stunned" by the news. He said: "He had an incredibly abrasive style but he cared far more for London transport than a lot of people gave him credit for. "He could be hard work but true believers often are." From the right of politics, Conservative MP David Morris, the chairman of the Trade Union Reform Campaign, also paid his respects. "Bob and I didn't agree politically, but you have to respect Bob because he did fight hard for his beliefs and for his members." Union leaders were quick to honour Bob Crow's contribution. TUC general secretary Frances O'Grady said: "This is shocking news. Bob was an outstanding trade unionist, who tirelessly fought for his members, his industry and the wider trade union movement. "He was always a good friend and comrade to me. We will miss him, and our thoughts are with his family and the RMT at this difficult time." Sir Brendan Barber, chairman of the conciliation service Acas, and former TUC general secretary, said Bob Crow was "one of trade unionism's larger-than-life characters, always battling with passion and energy for his members. "His bluff exterior masked a shrewd and intelligent negotiator who actually won high respect from employers as well as deep loyalty and support from his members. My thoughts are with his family at this difficult time." Matt Wrack, leader of the Fire Brigades Union, said: "Bob's passing is very sad news and the thoughts of firefighters will be with his family. "Bob was a good friend to me personally and to the Fire Brigades Union as a whole." Manuel Cortes, leader of the TSSA rail union, said: "It was a privilege to campaign and fight alongside him because he never gave an inch." He said: "Bob Crow was admired by his members and feared by employers, which is exactly how he liked it." Public and Commercial Services union general secretary Mark Serwotka, who sat on the TUC general council with Mr Crow, said: "Bob was a tireless fighter for RMT members and working class people and a towering force in the trade union movement. Mick Whelan, general secretary of the train drivers' union Aslef, said: "This is a sad day not just for the RMT and the rail industry but for the trade union and labour movement." Len McCluskey, general secretary of Unite, said: "Bob was a life-long, and highly successful, fighter for the interests of his members and for working people as a whole. "I am sure that is the only epitaph he would have wanted." Media captionBob Crow: "We do not call strikes for the sake of it"
Martin Griffiths, chairman of the Rail Delivery Group, which speaks on behalf of the rail industry, said: "Bob Crow was rightly recognised as one of the rail industry's most passionate voices, who championed the crucial role played by staff in delivering a safe service to passengers." Sir Peter Hendy, London's Transport Commissioner, said he was "terribly sad" at the "unexpected news". 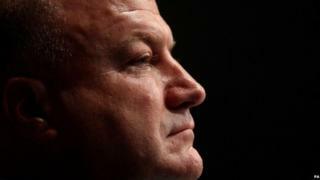 "Our thoughts are with Bob Crow's family, friends and all those he represented," he said. John Cridland, director-general of the CBI, said: "We often disagreed on employment relations, but Bob Crow was a doughty and committed advocate for his members. "I would like to extend my sincere condolences to his family, friends and colleagues at this very difficult time." Sir Brian Souter, chairman of transport group Stagecoach, said: "Bob Crow was a passionate advocate for the country's railway. "He worked tirelessly on behalf of his members and shared our focus on the critical importance of safety. "His views on transport policy may often have been at odds with our own, but he was a man who commanded respect across the sector for his strength of belief in the causes he pursued." Transport journalist Christian Wolmar said Bob Crow was a "much more complex and subtle figure than we might imagine from the media". "He would take a public stance, make a lot of noise, to battle away for his cause while behind the scenes he was negotiating quite carefully, really trying often to avoid the strikes which publicly he was calling for. "He would keep the more extreme elements in his union down - all his friends would say Bob's a moderate." Radio 4 reporter Becky Milligan, who interviewed Bob Crow, said the RMT chief had been "great fun" and "very funny". On his job leading the union, she said Mr Crow had told her it was "his hobby as much as his job". "He was very passionate," she added. The Mirror's Carole Malone remembers Bob Crow as bolshy, argumentative and unapologetic "but a man you would want to fight your corner". Associate editor of the Mirror, Kevin Maguire, said on Twitter: "Bob Crow was a big burly bloke with a great brain, wit, heart of gold and surprisingly soft handshake. Missing him already." He also told the BBC many working people admired him. "When Bob would go around streets or you'd see him on trains, people actually gave him a warm reception. "They liked the fact that he stood up, said what he thought, in an era of political 'but and'. And they recognised - even when they were inconvenienced by a strike - that he'd actually done rather well for his members. "And a lot of people at work were thinking: 'Well, why isn't somebody standing up for me?'"